The story behind the name: The constellation Corvus is named for the crow, a bird associated with Apollo. The star pattern looks nothing like a bird. It consists of four bright stars that form a quadrilateral and better fits the Arab designation of a tent, or the sailor's lore that identifies it as a sail. 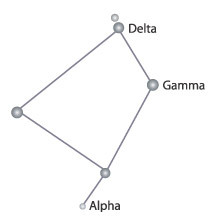 This constellation was not created because it looked like a crow, but because it was near the constellation Hydra. While Hydra is chiefly associated with a very different story, the snake shape also reminded sky watchers of a fable about Apollo, written down by Ovid, which involved a crow, a watersnake and a cup. With one element of the story already in place (the snake), the two constellations, Corvus (crow) and Crater (cup) were created to represent the other two story elements. In ancient times, when stories were passed on by oral tradition, it was useful to have the main points of a fable hanging in the sky for all to see. In the story, Apollo needed water to prepare a libation. He sent the crow, who did odd jobs for him, to bring water back in a cup. The crow was not known for having a serious or respectful attitude. At the water source, he found a tree of ripe figs and could not pass up feasting on them. He realized that he had kept Apollo waiting and that the god would be angry so he snatched up a water snake (not the infamous Hydra) and brought it back with him to blame for his delay. Apollo did not believe him and threw the crow, the snake, and the cup up into the sky. As a punishment, the crow is never able to reach the water in the cup. The crow and the raven (a related bird) were also associated with other stories about Apollo.